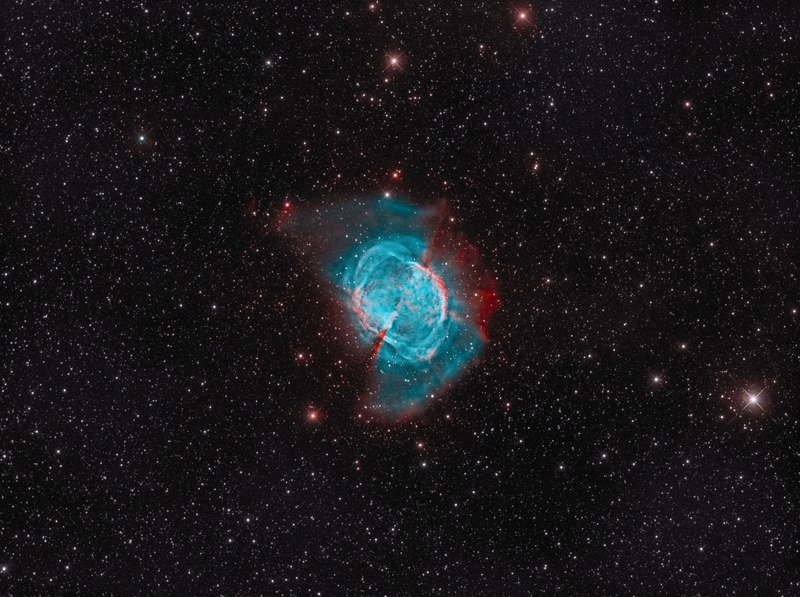 This is M27, AKA the Dumbbell Nebula. It’s a planetary nebula. They are called planetary nebula because many of them in early telescopes looked like fuzzy little planets. It was once thought they were planets still forming. They are actually made when a red giant star explodes and throws off a large part of its mass into the surrounding space. What makes these especially neat is they are only visible for a few ten thousand years or so. Relatively short in the scale of the universe. This is one of the largest and brightest in the night sky. This is a narrowband image made up of 2 channels. Red is the Hydrogen-alpha and the green/blue is Oxygen III. Looking closely at these two channels allows one to see the specific structures for each ionized gases. This is made up of 25.8 total hours of exposure. I took several passes at processing this. The dynamic range is huge. The outer halo is very faint, while the inner parts of the core, by contrast, are fairly bright. This required layering various image and blending them together in addition to carefully blending the two primary channels to ensure the structural details were preserved and well represented. This was actually the first image taken with my mount, an Astro-Physics Mach1GTO. The new mount and longer focal length telescope allow me to take images of smaller and/or more distant objects. For this I actually blended older data from my smaller telescope. Using that older lower resolution data for color and the new high resolution data (also blended to enhance the color data) used for the luminance I was able to shoot a specific area inside the Soul Nebula found near Cassiopeia. 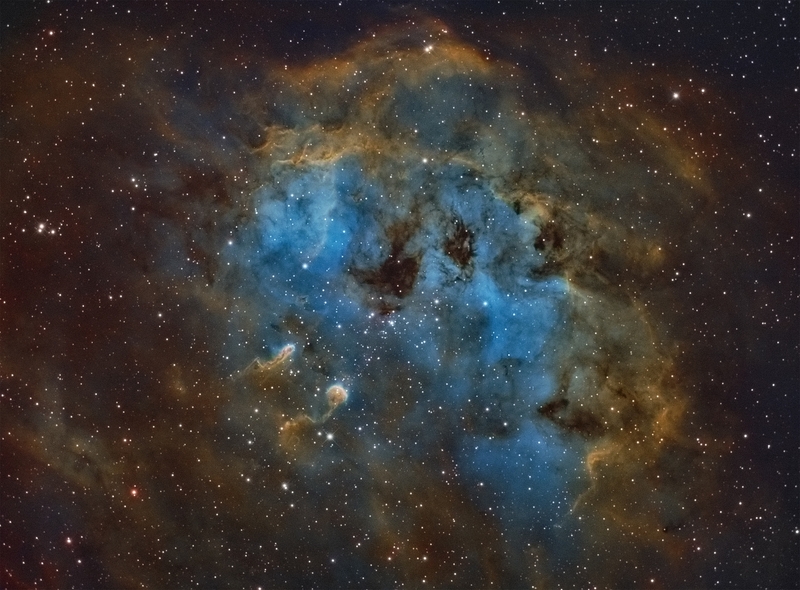 The image was taken from my light polluted backyard using Hydrogen Alpha and Oxygen III narrowband filters. It’s a total of 14 hours and actually was chosen as the AAPOD2 (Amateur Astronomy Picture of the Day) on 18th of March 2018 which was a very pleasant surprise.